Whilst there are a number of books on the main forms of building contract, very few deal with subcontracting. 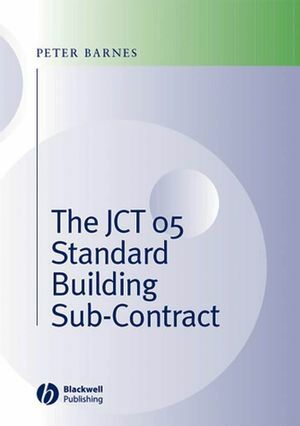 This book examines the new JCT Standard Building Sub-contracts for use with the radically revised 2005 JCT Standard Building Contract. It looks at the key contract conditions, considers the rights and obligations of the parties and how risk is allocated, and discusses the main practical problems that arise. Peter Barnes MSc (Construction Law and Arbitration), FCIOB, FCIArb, MRICS, MICE, is a Chartered Arbitrator, a registered Adjudicator and an accredited Mediator. He has been actively involved in the construction industry for over 30 years and has a wide experience of many types of construction work. He spent many years working for main contractors, undertaking both surveying and management roles, and during that time he administered and settled a multitude of sub-contract accounts on a variety of different contracts. Since becoming a consultant, he has represented many parties in both adjudications and arbitrations, and has been appointed as adjudicator by both the Chartered Institute of Arbitrators and the Construction Industry Council. He is co-author of the book titled, ‘Subcontracting Under the JCT 2005 Forms'. Chapter 1 – The purpose and use of the JCT Standard Building Sub-Contract (2005 Edition)..
• Formation of Contract / Letters of Intent. • Standard Forms of Contract and Sub-Contract..
Chapter 2 – The JCT Standard Building Sub-Contract Agreement (SBCSub/A or SBCSub/D/A)..
• The structure of the SBCSub/A and SBCSub/D/A. • Summary of Interim and Final Payment provisions. Chapter 3 – The JCT Standard Building Sub-Contract Conditions (SBCSub/C or SBCSub/D/C): Section 1..
[including clauses 1.1 to 1.10 of SBCSub/C and SBCSub/D/C inclusive]..
• Reference to clauses etc. • Sub-Contract to be read as a whole. • Headings, reference to persons, legislation etc. • Reckoning periods of days. • Contracts (Right of Third Parties) Act, 1999. • Giving or service of notices and other documents. • Effect of Final Payment Notice. Chapter 4 – SBCSub/C or SBCSub/D/C: Section 2 – Carrying out the Sub-Contract works [Clauses 2.1, 2.2, 2.4 to 2.15 inclusive] [and Schedule 5 Contractor’s Design Submission Procedure]..
• Materials, goods and workmanship. • Compliance with the Main Contract and Indemnity. • Supply of Documents, Setting Out etc. • Sub-Contractor’s Designed Portion information. • Further drawings, details and directions. • Errors, Discrepancies and Divergences. • Preparation of Bills of Quantities and Contractor’s Requirements. • Bills of Quantities and SCDP Documents – errors and inadequacy. • Notification of discrepancies etc. • Discrepancies in SCDP Documents. • Divergencies from Statutory Requirements. • Sub-Contractor’s Design Portion Design Work. • Design liability and limitation. • Errors and failures – other consequences. • Unfixed Materials and Goods..
Chapter 5 – SBCSub/C or SBCSub/D/C: Section 2 – Carrying out the Sub-Contract works [Clauses 2.3, 2.16 to 2.21 inclusive]..
• Time of commencement and completion. • Adjustment of Period for Completion. • Generally – The purpose of clauses allowing for the adjustment of the period for completion. • Notice by Sub-Contractor of delay to progress. • Fixing Period for Completion. • Practical Completion and Lateness. - What is practical completion?. - Date of practical completion. • Failure of the Sub-Contractor to complete on time..
Chapter 6 – SBCSub/C or SBCSub/D/C: Section 2 – Carrying out the Sub-Contract works [Clauses 2.22 to 2.26 inclusive]..
Chapter 7 – SBCSub/C or SBCSub/D/C: Section 3 – Control of the Sub-Contract works [and Schedule 1 Sub-Contract Code of Practice]..
• Access for Contractor and Architect / Contract Administrator. • Opening Up and Remedial Measures. • Directions to open up and test. • Work not in accordance with the Sub-Contract. • Instructions and deductions under the Main Contract. • Workmanship not in accordance with the Sub-Contract. • Effect of non-compliant work by others. • Schedule 1 Sub-Contract Code of Practice. • Attendance and Site Conduct. • Attendance and temporary buildings. • Health and Safety and CDM Requirements. • Suspension of Main Contract by Contractor. • Benefits under the Main Contract. • Certificates under the Main Contract..
Chapter 8 – SBCSub/C or SBCSub/D/C: Section 4 – Payment. [Clauses 4.1 to 4.18 inclusive]. [and Schedule 3 Forms of Bonds; and Schedule 4 Fluctuations Options1..
• Sub-Contract Sum and Sub-Contract Tender Sum. • Taking adjustments into account. • Final Sub-Contract Sum - Adjustment Basis. • Final Sub-Contract Sum – Remeasurement Basis. • Calculation of Final Sub-Contract Sum. • Construction Industry Scheme (CIS). • Issue of interim payments. • Interim payments – amount due. • Counterclaim, set-off and abatement. • Timing of Payments, Payment Notices and Withholding Notices. • Sub-Contractor’s right of suspension. Chapter 9 – SBCSub/C or SBCSub/D/C: Section 4 – Payment. [Clauses 4.19 to 4.22 inclusive]. .
• Matters affecting regular progress. • Potential heads of claim for a Loss and Expense claim. • Inefficient or increased use of Labour and Plant. • Head Office Overheads and Profit. • Interest and Finance charges. • Common Law Damages claims..
Chapter 10 – SBCSub/C or SBCSub/D/C: Section 5 – Valuation of Work and Variations [and Schedule 2 Schedule 2 Quotation.]. . • Variations ‘under’ the Contract. • Why are variation clauses ‘under’ the contract included in contracts?. • What is a Variation?. • How is a Variation instructed?. • Must a Sub-Contractor comply with all Variation directions issued?. • What happens if a Sub-Contractor does not comply with a direction issued?. • Change of conditions for other work. Chapter 11 – SBCSub/C or SBCSub/D/C: Section 6 – Injury, Damage and Insurance. .
• Injury to Persons and Property. • Liability of Sub-Contractor – personal injury or death. • Liability of Sub-Contractor – injury or damage to property. • Insurance – Loss or Damage to Work and Site Materials. • Specified Perils cover under Joint Names All Risks Policies. • Sub-Contractor’s responsibility – damage to the Sub-Contract works etc. • Terrorism Cover – non-availability – Employer’s options. • Damage to Sub-Contractor’s plant etc. • SCDP Professional Indemnity Insurance. • Joint Fire Code – compliance..
Chapter 12 – SBCSub/C or SBCSub/D/C: Section 7 – Termination. .
• Default by the Sub-Contractor. • Insolvency of the Sub-Contractor. • Default by the Contractor. • Termination under the Main Contract. • Insolvency of the Contractor. Chapter 13 – SBCSub/C or SBCSub/D/C: Section 8 – Settlement of Disputes..
• Schedule of notices and instructions..
Table of statutes and regulations..
'There is a superb background chapter on getting into contract. Then Barnes takes his reader through the machinery of the standard form. Better still, he tells you what to look for when signing up. The author's analysis of time obligations is excellent, as is his section on control of changes. Payment rules are comfortably explained. In short, Barnes is willing to share his 30 years of disputes with you and we could do with more books by him.' Tony Bingham, Building. * The majority of construction work undertaken by subcontractors.